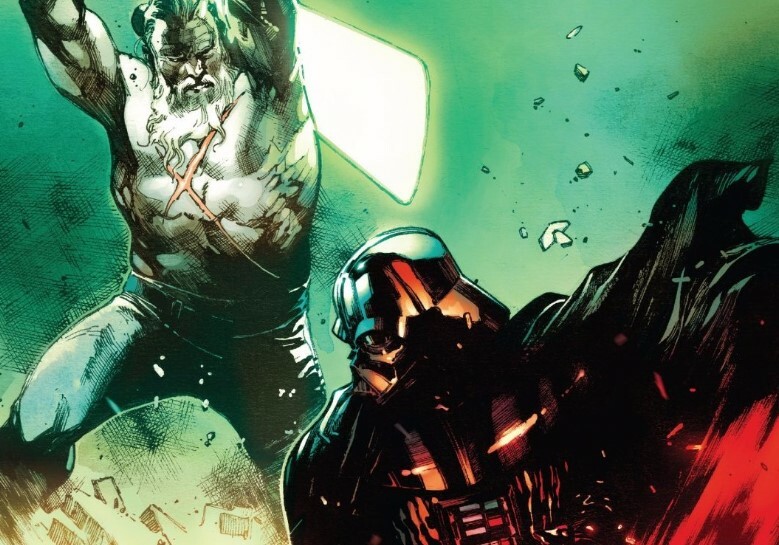 Charles Soule takes Darth Vader down hard, preparing to raise him up into a force that the entire galaxy would learn to fear. Revenge of the Sith ends with Anakin Skywalker badly injured, the ruins of his body encased in armor. Charles Soule has added a new element to this; at first, the Sith Lord didn’t even have a lightsaber. It seems that Sith gain their lightsabers from the body of a Jedi, and now Darth Vader must find a surviving Jedi in order to kill him. 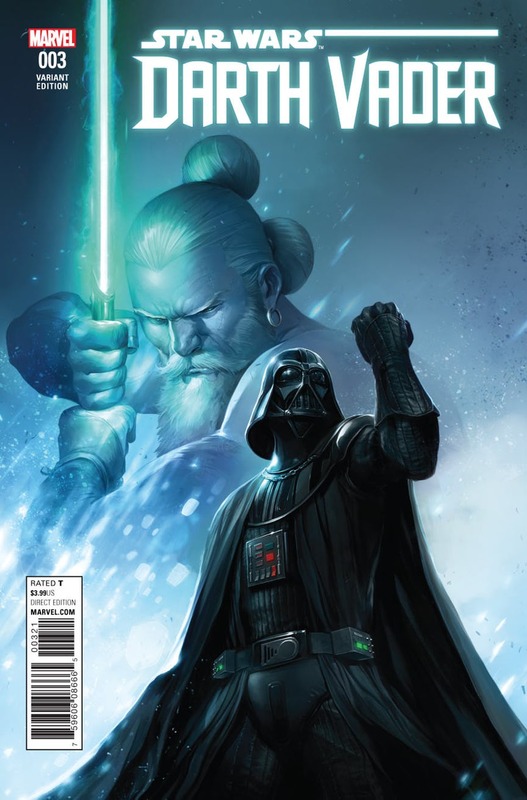 In Darth Vader #3, that quest leads the Dark Lord of the Sith to the River Moon of Al’doleem. 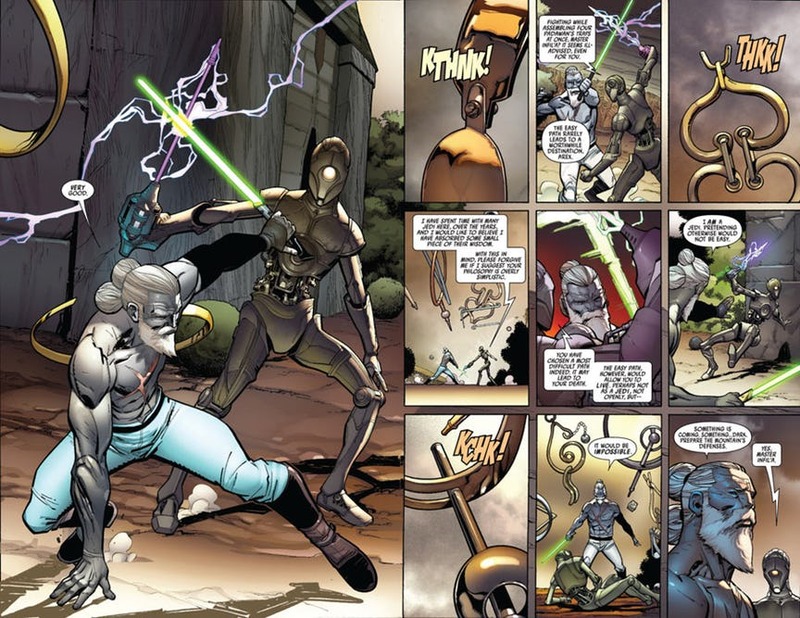 He’s tracked down Jedi Master Kirak Infil’a, a warrior Jedi who took a Barash Vow of non-interference, and aims to gain that crimson lightsaber. Unfortunately, as we learn straight away, Darth Vader really isn’t ready. 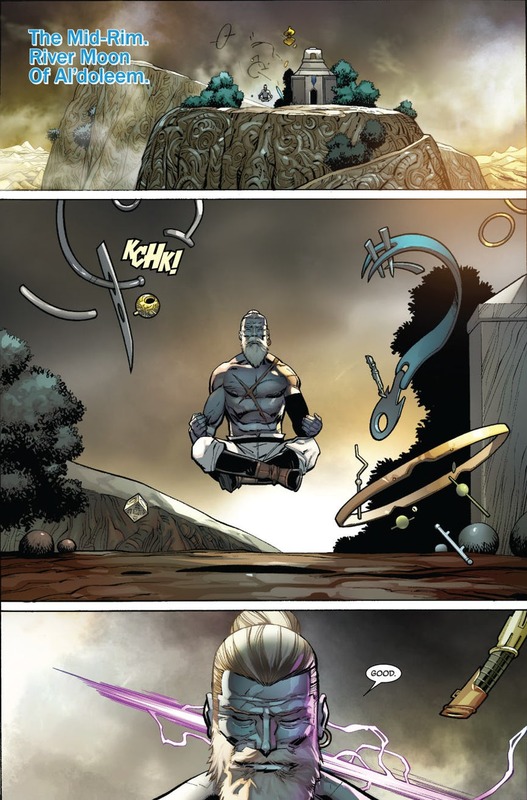 The Sith Lord is new to his armor, and struggling to deal with the cybernetics that affect his balance. Unarmed, he’s going up against one of the most powerful Jedi he’s ever faced. The story opens with Infil’a crippling Vader’s ship, and launching a series of cunning traps against him. Anakin Skywalker always tended to lack environmental awareness, and that weakness shows once again, as a sluice gate sends a deluge of water down upon him. Infil’a tests him, probes his skills, and pronounces him weak. By the duel’s end, you can tell Infil’a has worked out what Darth Vader is. He correctly deduces that there must be a master, and casts the Sith Lord aside. The relative ease with which he does so is sure to leave a lot of Star Wars fans reeling; we’re used to the idea that Darth Vader is an unstoppable juggernaut, but that’s not yet the case here. This Darth Vader is raw and relatively untested, unused to the cumbersome armor and the cybernetic limbs, and struggling to master his own pain. 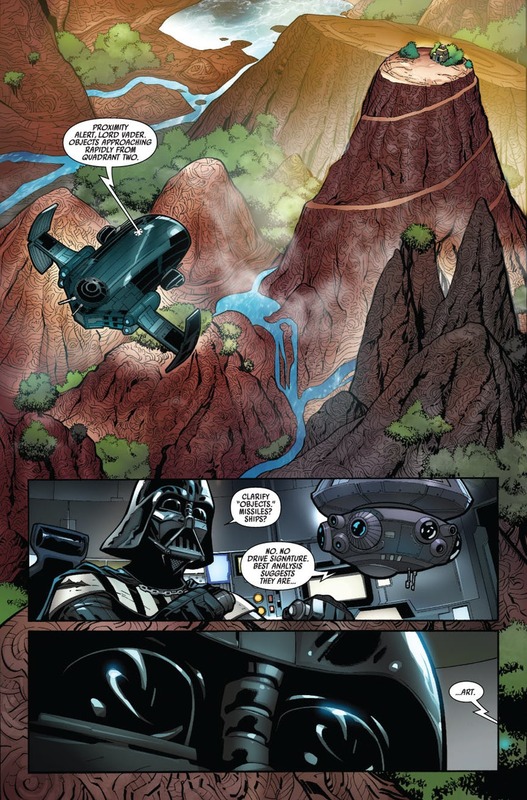 Kieron Gillen’s earlier Darth Vader run established that, back in these early years, Palpatine wondered if the Chosen One had been broken beyond use. Reading Darth Vader’s duel with Infil’a, it’s easy to see why Vader’s Master doubted him. His offensive is broken within seconds, he loses control of the duel, and soon he’s literally tossed off the side of a mountain. Worse still, Infil’a considers his vow complete, and is planning to return to the Galaxy and reform the Jedi Order! Giuseppe Camuncoli’s art is superb here, and he ensures that the River Moon feels like a unique place. I love the opening sequence, as Infil’a proves his skill by duelling even as he uses the Force to assemble Padawan’s traps. As the battles progress, Camuncoli manages to effectively convey the sense of movement and drama. And yet, the standout image is surely a close-up on Darth Vader’s face, as he confesses that he has come to kill Infil’a. How do you turn a broken man into one of the greatest villains of all-time? 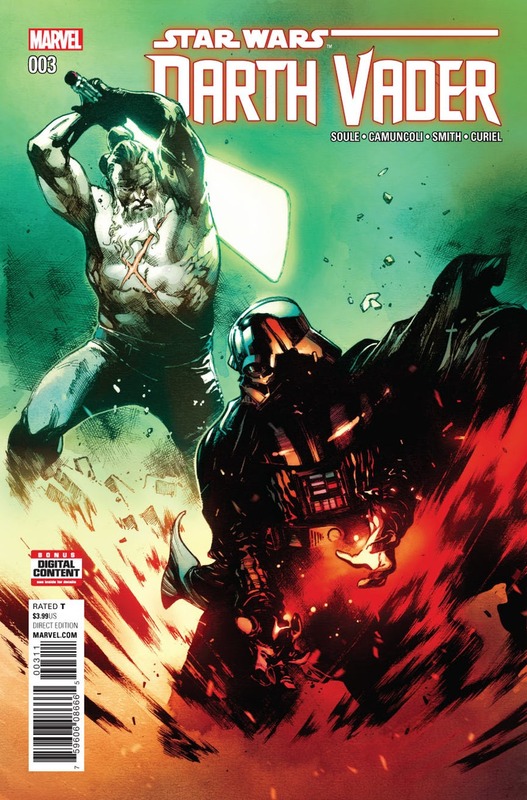 Right now, that’s the challenge facing Charles Soule in his Darth Vader run. The danger is that, if you over-do the brokenness, you leave readers unable to understand how Anakin Skywalker became the man the galaxy feared more than anyone else. 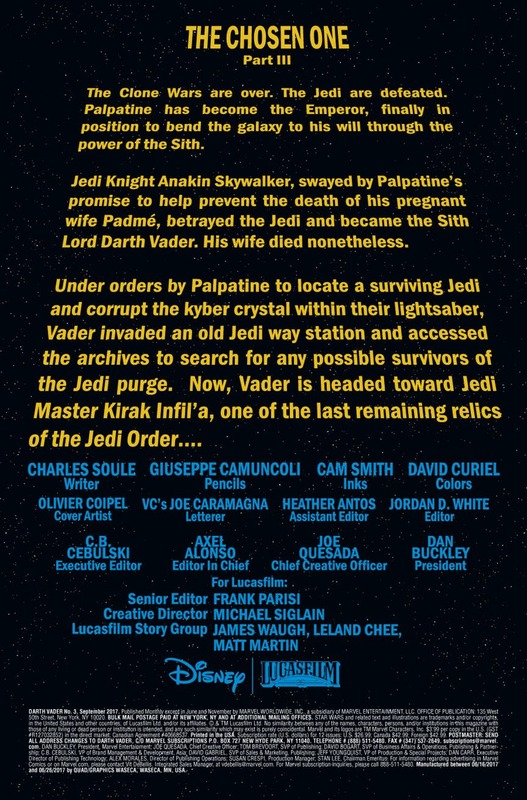 Having brought Darth Vader down so low, I’m fascinated to see how Charles Soule turns this tale into the story of Vader’s rise.